Click HERE for current AVAILABILITY on this trip! Click HERE for Why our Trips are Unique & What Others Have Said About our Trips! Click HERE for How to Sign up for our Trips AND Important SD Trip Booking Related Info. ALL Inclusive Meals & Snacks!!! ALL INCLUSIVE DRINKS INCLUDING ALCOHOL!!! ONLY 9 Rooms on the whole boat with up to 18 Divers MAX*!!! THE ONLY DIVING GROUP WHERE BEING SINGLE AND SOLO IS A GOOD THING! EVERYONE WILL BE TRAVELING SOLO...COME HANG WITH OTHER BUDDYLESS DIVERS AND RING IN THE NEW YEAR!!! Price includes cash discount. Please add 3% if paying via any non-cash form of payment. SEE MORE DISCOUNTS FOR EARLY BOOKING & MEMBERS BELOW!!! OPTIONAL: * Note - All optional add-ons must be paid for in advance for these prices. Additional costs may apply if you sign up on the boat. 3. All trip participants will need to be premier members of our site so that we can effectively communicate with you and help to manage your trip/vacation more easily. Its only $35 a year and you'll get $25 back after EVERY trip you take with us if by mailing in the Rebate Form. To become a premier member click on the MEMBERSHIP tab along the top of the forums and follow the prompts. 1. Early Pay in Full Discount: Sign up and pay in full by April 30th and get $50 off the price and get (5) chances to win 50% off your trip up to $900, + Free Autographed Scuba CD by our very own Pup Morse, and a chance to Win Free Oceanview Upgrade and Free Nitrox. 2. Early Booking and Deposit Discount #1: Sign up and deposit by May 30th for (1) chance to win 50% off your trip up to $900. 5. Membership Discount #1: Save $75 by getting your trip docs (SD waiver, survey, ins statement, EV boat waiver) submitted within 21 days. 6. Membership Discount #2: Get a $25 rebate after the trip by submitting for your premeir membership bonus within 30 days after the trip. 7. Sleep Together Discount: Take $150 off the price of the trip per person if you will share a room that has one queen/double bed in it. 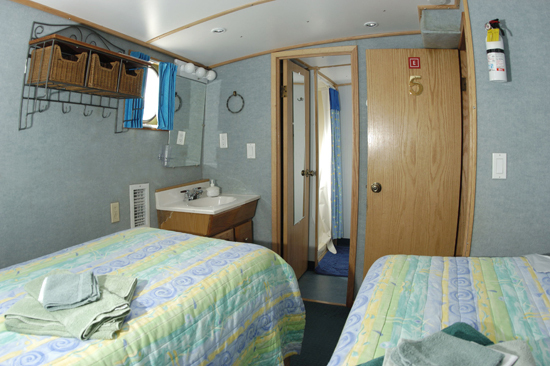 We have (2) cabins on this boat that have that configuration. ASAP: $500 non-refundable deposit (except via trip insurance) in order to secure a spot. No spot will be secured until money is rec'd via our Secure Payment Gateway. (See link along top, on home page and in my signature line. 4-17-13 $500 non-refundable deposit due at booking to hold a spot payable only via SD's payment link.. Note: Trip must be paid in full 60 days days prior to departure. Missing payments can forfeit your spot to the next person on the waiting list. DIVE Insurance is MANDATORY! 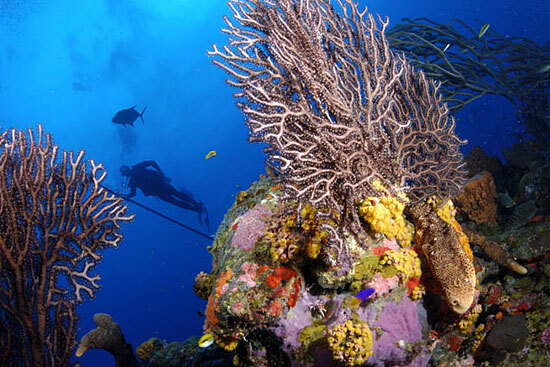 DIVE insurance is VERY inexpensive. Even if you have insurance that you think covers DIVING ACCIDENTS and air lifts…it is CHEAP (less than $100) to get a supplemental policy to ensure you are covered for an entire year of diving. Diver's Alert Network please use reference #1603080 Click here for Diver's Alert Network and use our reference ID1603080. Dive Assure please reference us via the drop down menu. Click here for Dive Assure for either a 'one time' policy OR an annual policy that is BOTH Dive & Trip Insurance providing PRIMARY COVERAGE with excellent rates and coverage! TRIP INSURANCE IS OPTIONAL BUT STRONGLY ENCOURAGED. If you miss the Flight to SXM you MAY be able to catch a flight the next day but the boat will have left and you'll have missed the trip! If you choose to self-insure that is fine but you also choose to accept all losses accordingly as SD.com nor any vendors will be responsible for losses due to non-insurince. Click here for a free quote from CSA Travel Protection or to purchase online! NOTE: One of the reason's we have you finalize your extras and pay for everything by 30-60 days out is so you have more flexability getting trip insurance. Please take a moment TODAY to do this important task. />/> *If you think it can't happen to you please think again...sadly it happens A LOT!! While OUR personal Saba & St Kitt's Week Experience may vary due to weather and conditions, the outline below will give you a good feel for the exciting week in store for us! KEEP CHECKING BACK AS MANY ACTIVITIES ARE STILL BEING LINED UP FOR THE AMAZING WEEK OF FUN IN THE SUN AND CRITTERS IN THE SEA!!! Days Prior to start of our trip: If you wish to arrive early or want to combine other diving or touring adventures in conjunction with this one let us know. We can add days to the FRONT or the END of your week as well as several days of local site seeing if you like or just an extra night to be sure you catch the boat! Saturday Dec 28,2013: This will be the official ARRIVAL date in San Martin SXM. You can arrive up til midnight. Group Orientation and the evening of our first Welcome Happy Hour! 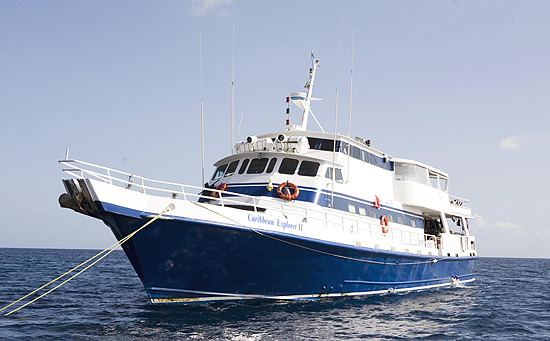 Dec 29-31, 2013 and Jan 1-2, 2014: These 5 days will be our group package of up to 5 tank dives off the boat. The first dive starts at 7:45am and the boat will return after each dive allowing you the luxury of sleeping in or skipping a dive. Breakfast, lunch and dinner along with alcoholic and non-alcoholic drinks are included daily and are available on the boat. REMEMBER...your first drink is your last dive! Entertainment & Activities: This week allows for several tours on the islands we visit. They will be in the afternoons and we'll post which days they will be on later. You will miss your afternoon dives if you go and see the islands via the optional island tours. Monday: 5 dives and LOTS OF NIGHT DIVE OPTIONS..
Wednesday: 5 dives and its NEW YEAR'S EVE...We'll celebrate in style AND still go diving the next day! Thursday: The last day of our diving pkg and the first day of 2014 and a great way to start your new year off right diving all 5 dives! Friday: We usually have an early dawn dive or two and then we head into port where we'll gear and pack and then enjoy dinner on our own seeing St Kitt's while docked at shore for our last night together. Jan 04, 2014: This is our travel day home. You will fly INTO SXM and out of SKB. There are no real restrictions upon arrival or departure times EXCEPT you can not board the boat until 3pm and you must leave the boat by 9am. Most divers choose to book their own air so they an use miles, their preferred carrier or because they have more time to search out deals. If you wish for SingleDivers.com to research and/or book your airfare ticket for you we are happy to do so for a $30 research & booking fee. 1) Post in this thread that you plan to join us and advise your check or credit card payment is on its way via our SECURE ONLINE PAYMENT GATEWAY. (SEE PAYMENT LINK IN MY SIGNATURE LINE OR AT THE TOP OF THIS TRIP POST/TOPIC.) We'll then put your name on the 'check's in the mail' list. (Please send your pymt asap as we can NOT hold any spots on this trip. Your spot will ONLY BE CONFIRMED when we receive your $500 non-refundable deposit or get the early payment deals with payment in full by April 30, 2013. )To join an SD trip you must be a premier membership which is $35 a year and you can get $25 back after the trip as a member rebate if you file for it. 2) Fill out the Trip Rooming & Diving Survey. need to make special arrangements about payments, please contact me and I'll gladly try to work with you. 6) PLEASE USE THE BOOKING TEMPLATE IN POST #4 or #5. We need to know if you need rental gear, will be diving nitrox and if you want d/o or s/o for the trip. You MUST include as much of this information as possible with your initial reservation or the type of room you want may no longer be available when you finally clarify for us. a. I have trip insurance that covers this trip already. b. I will purchase trip insurance to cover this trip. TRIP INSURANCE BUT IT IS STRONGLY RECOMMENDED. going on a tour, etc. trip post. For more information on SingleDivers.com, booking policies, etc please read here. custom questions or special requests. SingleDivers.com uses a secure online payment gateway that allows you to pay for trips or merchandise using either an e-check which debits your checking account directly without having to mail in a check or debits your credit card without having to fill out a SD.com credit card authorization form. (Please note that any non-US bank originating credit card MAY still have to use the paper credit card authorization form as different processing procedures may be followed to process international/non-US credit cards. You'll find this form in the Forms Forum link in my signature. - NOTE: For the State us AA if using an international credit card. [i]SingleDivers.com provides its members with pricing that reflects all possible cash discounts so any payments via credit card or paypal will still incur a 3% non-cash convenience fee. Our SECURE payment gateway which you can access by clicking the PAY HERE LINK along the top, in my signature line and on the homepage of SingleDivers.com. [i]If you are unable to use the gateway please provide a complete description of the problem/error you are encountering and contact kamala@singledivers.com immediately to manually process your payment for you. The gateway will add a 3% non-cash convenience fee if paying via credit card or any non-cash option. Checks, money orders and real cash are discounted already. International/ Non-US Clients: Please use the traditional written credit authorization form to submit credit card payments IF the payment system does not work for you. (Remember use AA as the state and it should work). Click here for the form and ask trips@singledivers.com for the password. 1. 4-17-13 Trip opened up for booking! 3. To aid proper booking and pre-trip communication, all members need to be premier members or above. To upgrade click on the MEMBERSHIP tab across the top and follow the prompts. 4. We have a late document fee on our trips. To avoid it simply get your documents to us within 3 weeks of signing up for the trip. (Does NOT include booking your air.) Need more time? No problem we'll add the $75 document fee to your final invoice. 5. Check out our member's photo galleries from a previous trip HERE! FAQ - CHECK HERE OFTEN TO AVOID READING ALL THE POSTS IN THIS THREAD! 110V. Same as U.S. and same 2 pronged outlets. YES. 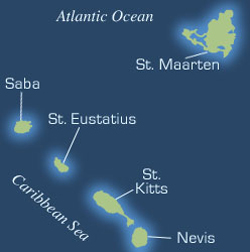 Please visit www.travel.state.gov and choose "International Travel" and "Saba or St Kitts" to get the latest information. U.S. citizens need a passport that is valid for 6 months PAST the date of arrival. For legal reasons, we cannot make official recommendations regarding shots or immunizations. Please consult with your physician or visit www.cdc.gov for more information to make the decision that is right for you. Note that our members are welcome to give you their opinions. Currently, you are allowed 2 checked bags of 50 lbs each and 1 carry on and 1 personal item. Checked luggage between 51-70 lbs will be charged $TBD/bag. The carry on is more of a size-related issue rather than weight. Waterwill vary based upon how early winter is and if we have an Indian Summer, etc , 75-150' vis, walls, corals, reefs, pinnacles, wrecks, turtles, tropicals, critters. We'll fall off the main boat and come back to it after diving. So effectively there are no boat rides other than transits from one dive site to another. Q. What is the price of Nitrox? A. Nitrox will be $150 for the week and is UNLIMITED. Q. What does All-Inclusive drinks mean? A. All drinks including water, soda, juice, house wine, domestic beers & domestic liquors. Drinks during meals and in between are covered by your package. The bar will close at a reasonable hour to facilitate diving the next day but other than that...all your liquid needs can be met! Q. Can I extend my trip and dive another week? A. Sure! A second week either before or after is the same price as our singles week! $999 d/o + 16% tax = $1159 ALL INCLUSIVE!! $1199 s/o + 16% tax = $1391 ALL INCLUSIVE!! Q. How about extending for an extra night? Q. What is the cost for Rental Equipment? A. Let us know what you need for rental gear? We will have Cochran computers available that you can use to do DAN research AND avoid having to rent. As for other rental gear...please let us know and we'll get you the prices. Laser lights - $ ea. Light Sticks - $ ea. Q. Do divers need locks for the lockers? A. No there is a shared large locker room that is locked at night. Q. How many 100cf tanks you all have and if there is an extra charge for them. Do you have DIN tanks? A. The resort only has 80cf tanks. They have a few DIN tanks but you should always bring your own DIN Adapter just in case. Q. Why the big deal over trip insurance and when do I have to buy it if I want it? A. People are used to things being pretty good and not worrying about things like insurance. However for some reason MORE people have experienced having to cancel a trip or having their vacation ruined due to accidents, illness, death in the family and even death of the member. And while our vendors and SD truly want to help you, we are extremely limited in what we can do if you did not take out trip insurance. Therefore we will be STRONGLY ENCOURAGING you to buy trip insurance and consider an annual plan like Dive Assure (link at end of first post) to cover all those unexpected things that would otherwise cause you to lose most if not all of your vacation monies. NOTE: CHECK YOUR POLICY for the last day to buy it so it covers your trip. Some require it with the deposit and some before our last payment. The SOONER the better as it will not cover you AFTER you need it UNLESS you buy it BEFORE YOU NEED IT!!! Q. I want to bring School Supplies for the kids. What is best to bring? A. The basics are always hard to come by...notebooks, paper pads, pens, pencils, pencil sharpeners, markers, etc. Please bypass the ones that are more like toys. And please bring them in one of the million canvas totebags you get from conventions etc....that way they stay together AND a child will end up with a book bag...plus we don't add more plastic to the already challenged environment. You might also pick up some cheap 'readers' from the dollar stores...they will help kids who have a problem reading without glasses. And if you do not want to bring supplies but would rather donate money that is fine too. School supplies have a 50% import tax on them so they become very expensive in the country. That is why paper is good to bring as it is heavy to import and expensive once it is on island. But ANYTHING you bring will be gladly accepted and put to good use. NOTE: Do not pack a box to bring supplies in. Use a suitcase so it looks like it is your personal items. A box will usually be opened and then you will be taxed on the supplies you are bringing in...EVEN if they are for charity. Q. I am new to the single divers website and am interested in getting some more information about your trips. I was looking at this trip. Do you have people from all over and all ages and experience levels that go on these trips? A. Yes we do. Divers range from about 25 to 55, we average about 40% women…sometimes more on our trips…several have been essentially 'chick trips' with more gals than guys and we have every one from novices with 6 dives to master scuba diving instructors on trips. EVERYONE is welcome and we love new(er) divers. We even offer an innovative program for new divers that is part divebuddy/dive mentor. Its called Rent-A-Buddy and you hire a private DM to be your buddy so you can focus on YOU and YOUR diving and not worry about anything or anyone else. Your buddy will also mentor you providing customized feedback on YOUR diving helping to reinforce GOOD habits or develop GOOD habits right from the start. Everyone who participates in this program RAVES about it. Its quite reasonable…$50 per day or $150 for the week. Q. I'm trying to decide if I should do a double occupancy to save money or a single just in case the roomie thing does not work out. What do you recommend? Q. I noticed in the "who's going" section that most of the people have nitrox, is that a problem if I don't? A. 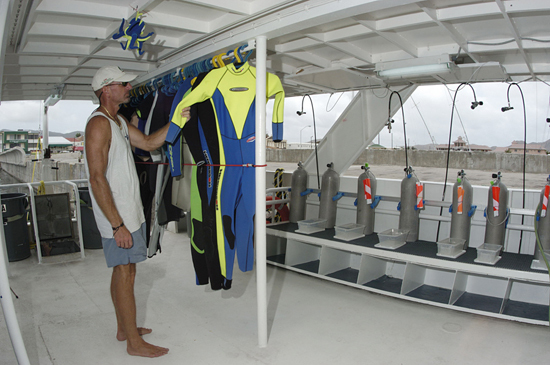 Absolutely not but many divers find it will allow them to dive more since we are doing 3 boat dives a day. We'll have an instructor on the trip so if you want to take the class while you are there it's a great way to combine diving and training. Air divers will be buddied with other air divers and/or I'll dive with any air diver that needs a buddy. SD.com will help you with the buddy arrangements! Q. Do I need to sign in as a member to be able to access all the forms that are needed? A. Yes you will need to register on the site with a screen name (choose a fun diving or personality related one if you can) and you'll need to be logged into the site to post. Once you tell us you are going on a trip with us we send you a link to the forms in case you have not found the link in my signature along with the password for the forum. (Note it is NOT the same as your login password.) To sign up for a trip simply POST in the topic/thread that you want to go with us, your payment is enroute and then tell us if you'll need extra days, if you want double or single occupancy, if you want nitrox or air, etc. PLEASE NOTE THAT ALL TRIP IN 2012 WE REQUIRE YOU TO BE A PREMIER MEMBER SO WE CAN EFFECTIVELY COMMUNICATE VITAL TRIP DETAILS DURING THE BOOKING PROCESS AND ALL PRE-TRIP PHASES. Q. What would be the easiest way to pay with my credit card for this, could I call you and pay that way? A. You can pay with credit card via our secure online web payment gateway. Simply click on the PAY NOW button along the top of the forums or in my signature line and it will allow you to pay via cc or your checking account. All prices are discounted for cash so if not paying via check please include the 3% non-cash convenience fee. If using a credit card not drawn on a US bank you may have to fill out our credit card authorization form so we can process your payment manually (found in the forms forum link in my signature) and email it as a pdf to me to kamala@singledivers.com or fax it to me to 888-480-0906. Again please include the 3% non-cash convenience fee if paying via this method. Q. Is it more common for people to book their own flights, or do you do most of the travel arrangements for people? A. Actually most people do book their own flights. We are happy to help but charge a nominal $30 booking fee for researching and booking flights for you unless the flight is part of the trip package and then the price is covered in the trip cost already. Let us know if you'd like us to make travel arrangements for you. We simply add the $30 fee to your total invoice. Q. Can I get a Rent-A-Buddy for this trip...how does it work? A. Yes you can rent-a-buddy for the trip...we have a limited number of DM's/Instructors available for you to rent to help you focus on only yourself and not worry about being someone's buddy or to allow you to improve your air consumption and bouyancy etc. You are hiring a professional 'coach' to help you reinforce your recent open water skills or to help you refresh them or to just basically help to mentor you. The price is $50 per day or $150 for the week. If you need your rent-a-buddy to do your first night dive it is recommended that you consider the night dive specialty or even just the night dive sign off of AOW...Advanced Open Water via one of our instructors. Q. I want to bring School & LIFE Supplies for the kids. What is best to bring? A. Last year we discovered the need for the orphanage which covers ALL AGES includes simply clothing, toiletries and basic supplies which are always hard to come by...notebooks, paper pads, pens, pencils, pencil sharpeners, markers, etc. Please bypass the ones that are more like toys. And please bring them in one of the million canvas totebags you get from conventions etc....that way they stay together AND a child will end up with a book bag...plus we don't add more plastic to the already challenged environment. You might also pick up some cheap 'readers' from the dollar stores...they will help kids who have a problem reading without glasses. And if you do not want to bring supplies but would rather donate money that is fine too. School supplies have a 50% import tax on them so they become very expensive in the country. That is why paper is good to bring as it is heavy to import and expensive once it is on island. But ANYTHING you bring will be gladly accepted and put to good use. NOTE: Do not pack a box to bring supplies in. Use a suitcase so it looks like it is your personal items. A box will usually be opened and then you will be taxed on the supplies you are bringing in...EVEN if they are for charity. Life Supplies: We will compile a full list of things needed by the orphanage for the kids and let you know! Q. Is there a place on the site behind the scenes to discuss meeting up at airports, sign up for tours, important tips & tidbits, etc? A. Yes, about 30-45 days prior to the trip we'll have a private forum that only trip participants can see. 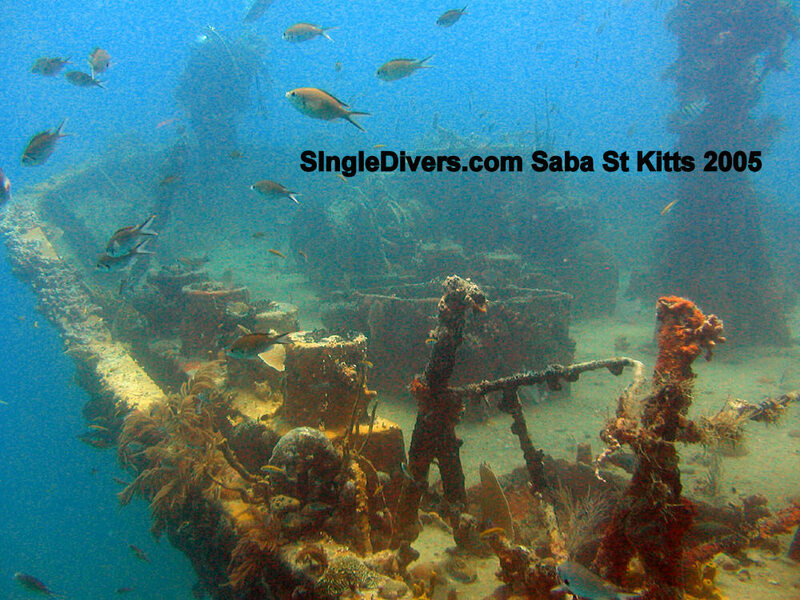 Please check out this forum: INSERT LINK HERE The password will be sent to everyone, but if ever needed again, please send an email to: Trips@singledivers.com and we will send it to you again. Check this link often for updates! It will not appear in the "view new posts". Q. I noticed that none of my flight info is listed in the area where everyone else's is for this trip! Was I supposed to post that info myself? If so, how do I do it! A. Yes if you want your info posted in the thread for your flight details you post it in a post saying here are your flight details and our trip coordinators or myself will post it in the first post. This also lets others know when you will be arriving as well. Q. Have you by any chance figured out who is going to room together yet? Q. Also for those of us who signed up ahead of time who might be able to get an upgrade...when does that all take place? When we get there? A. We do not announce the upgrade winner until right before the trip or until we get there. Q. So how does the $75 Document Fee work? A. Timely documents are critical to the success of our organization. Simply get your docs into us within 3 weeks of signing up for a trip and you'll save $75. If you need more time to complete your docs, we'll simply add the document fee to your final invoice. Wanna save some money get your docs in timely. Need more time? We'll just add the document fee to your invoice. NOTE: All documents are required no later than 30 days prior to the trip. Failure to submit them could result in the loss of your spot. If you are signing up within 30 days of the trip you have 3 days to get us your docs. PLEASE NOTE THAT FLIGHT DETAILS ARE NOT NEEDED UNTIL YOU HAVE PURCHASED YOUR FARE. We have 9 rooms for our NYE New Year's Diving Extravaganza! That is up to 18 divers and non-divers. 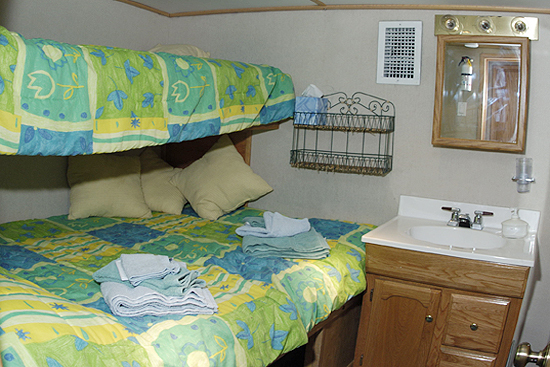 Once the boat is filled we can not get more rooms SO signing up EARLY ensures you get a spot! SEE BELOW IN RED FOR HOW MANY ROOMS AND SPOTS WE HAVE AVAILABLE AT ANY GIVEN TIME. 4. Mike aka Going Postal arriving one day early stayng 2-3 ex on back end. 5. Sandy aka Scubapunk arriving one day early. c. I will not purchase trip insurance and will accept all losses accordingly. 6. Membership Discount #B: Get a $25 rebate after the trip by submitting for your premeir membership bonus within 30 days after the trip. Trip Insurance: A I have trip insurance that covers this trip already. Trip Insurance: b. I will purchase trip insurance to cover this trip. Flight Details: Haven't bought tickets yet. will advise when I do. Flight Details: Tell us your flights as you get them. Trip Insurance: c. I will not purchase trip insurance and will accept all losses accordingly. Extra Days/Nights: not sure. I need a couple of days to research options. Like Miami for a few first or a few days early in SXM - roommate? B. I will get trip insurance. I got paid off once after a hurricane in FIJI cut our volunteer survey trip short a week. Trip Insurance: a. I have trip insurance that covers this trip already. Trip Insurance: B I will purchase trip insurance to cover this trip. c.I will not purchase trip insurance and will accept all losses accordingly. Reserved for future needs or add'l booking templates. This trip is NOW OPEN FOR BOOKING!!! Welcome to the SABA & ST KITTS NEW YEAR'S EVE BASH!! Trip Details and Booking/Sign Up thread/topic. Below you'll find the 5 easy steps for signing up for one of our trips and the booking template we use to capture your booking requirements correctly. Let us know if you need any help signing up via trips@singledivers.com or charlies@singledivers.com or kamala@singledivers.com. 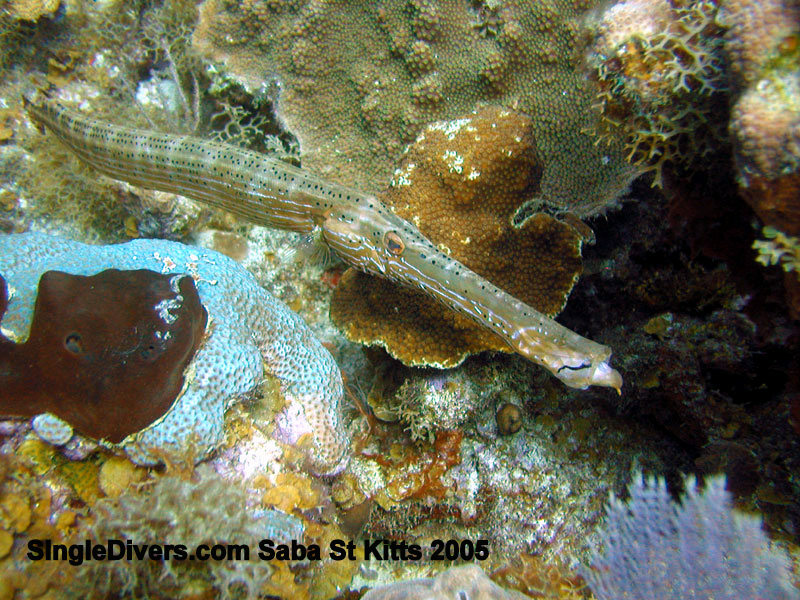 Otherwise come and join us diving in Awesome Saba & St Kitts...Hope to see you there!!! A. Are you new and have not registered on the site yet? Then think of a fun screen name click HERE for ideas and then register HERE. Follow the prompts and choose the 'premier member' option or above in this process and you'll be done. B. Currently a basic member? Then simply upgrade to premier by clicking on the MEMBERSHIP TAB along the top of the forums HERE and following the prompts for payment. We offer a secure payment portal to pay via check or credit card. Our system accepts MC or Visa and all checking accounts and some credit unions. Since all our pricing is offered at a cash discount, the system will add a 3% non-cash convenience fee for credit payments. We accept check payments via the "echeck" option in the payment portal/gateway at no additional charge so please do not "mail" us a check as it can take days and weeks to receive it in rural SC where SingleDivers.com is now corporately based. HERE is the link to our payment portal which is also found on our home page, in my signature line under my posts, across the top of the forums as the blue PAY HERE link and at the top of the trip details. After clicking the payment link you will need to enter your SingleDivers.com Screen/Display name so we can link you to the trip and your membership name. Choose the trip you are paying for from the dropdown menu and the amount you are paying for. ONLY enter what you are paying for in each payment. You'll find the BOOKING TEMPLATE below and an example of how to complete it. We hope in the near future that this step will be automated but until then please 'copy and paste' this into the the trip thread/this topic by clicking on the blue ADD REPLY button at the top of the forums (make sure the dialog box is empty before you start typing so your reply is not lost in other content. NOTE YOUR TRIP REGISTRATION IS NOT COMPLETE UNTIL YOU HAVE COMPLETED THIS STEP. The trip documents are needed for rooming, diving, understanding your preferences, as well as helping us help you in the case of an emergency etc. They are required to be returned within 21 days of signing up for a trip or if you need more time we'll add a $75 document fee to your invoice. They must be returned within 3 days if you are signing up within 45 days of departure. The trip docs are located HERE You will need to complete the first 3 documents...the Rooming/Diving Survey, The Medical/Liability Release and the Insurance Summary form. (There is also a check list you can download that will help you as well.) NOTE: All docs need to be returned to either trips@singledivers.com or via fax to 888-480-0906. A. The "Welcome to the Trip" PM (private message) which is sent to as soon as you sign up for the trip. You can not receive these unless you are a Premier member or above. As soon as you either pay or show interest in the trip thread/topic we'll send you this PM. It has helpful info about signing up for the trip and will be used THROUGHOUT the pre-trip process to keep you updated on critical things regarding your trip with us. B. The 2nd & 3rd 'posts' in this trip thread (the first has the trip details in it) will contain summarized updates so you don't have to follow every post in the original trip thread. PLEASE monitor these for IMPORTANT UPDATES that affect your trip. C. The Special Discussion Forums. They are private forums that open up approx 30-60 days before a trip and they are FILLED WITH HELPFUL INFORMATION you need for your trip like how the transfer work, money/tipping issues, who's doing what extra tours or diving, etc. We also use these forums to discuss PRIVATE matters such as exchanging celfone numbers so you can meet up at the airport together etc. ONLY members on the trip have access to these private trip discussion forums.  Since they are password protected you will receive the special password for the private forum via the TRIP PM. PLEASE USE THE FOLLOWING BOOKING TEMPLATE AND CUT AND PASTE IT INTO A NEW POST WITH YOUR REPLIES. 2. Early Booking and Deposit Discount #A: Sign up and deposit by May 30th for (1) chance to win 50% off your trip up to $900. D/O or S/O: I don't know what this means. Discounts & Incentives: I'm not exactly sure - I plan to pay in full by 30 April and send in my forms with 3 weeks and I'm a premier member. D/O is double occupancy and S/O is Single occupancy. Since you put down the d/o price, I take that's what you wanted. 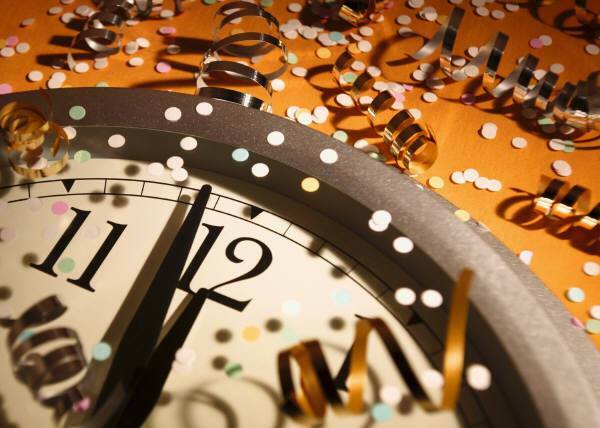 We are REALLY glad you'll be ringing in the New Year with us! Hey gang... the 'sleep together' discount is for COUPLES or a few gals that might want to save some money. IT IS NOT REQUIRED NOR EXPECTED. I just threw it out there in case someone was interested! I paid the whole $500 deposit but didnt get the password for the documents. theres something wrong with the link? If you change the way you look at things...the things you look at change. Board Status:Raja Ampat around the corner! Edited by jesterdiver, 29 April 2013 - 12:41 PM. Ok Kamala, looks like I'm starting AND ending 2013 with you!